I've been raising Monarchs for a few years in Hawaii, where the caterpillars only eat Crown Flower leaves (we don't have milkweed). Sometimes it's hard to find a sufficient supply. This year (2009) I've raised about 60. On January 9, six emerged within minutes of each other (see photo). I've posted some videos on YouTube you might enjoy. The most popular is "Monarch Butterfly Emerging" here. Another fun and amazing one is "Caterpillar to Pupa - Gone in 30 Seconds" -- the metamorphosis speeded up more than 6x its actual time here. Or a slower version, "Caterpillar Pupates - Alien Transformation!" (only 2x speed) here. You can tell that pupation is about to begin when the caterpillar's antennae become limp and lifeless, and metamorphosis is just moments away when it stretches out of its "J" formation and the body starts pulsating. The whole process is fascinating. Wow, it's great to hear from a Monarch Butterfly fan in Hawaii! I wonder how the Monarch Butterflies ended up in Hawaii?? Thanks for your youtube links. Check out my video of a monarch butterfly emerging here. Thanks for this info! My kids and I just found a monarch caterpillar crawling in the road near a busy street. We took it home and are letting it eat from the crown flower plant in our backyard. I spend time regularly in Kona on the Big Island. Plenty Monarchs around here, especially up the slope in residential areas. Amazing if they figured out how to get to Hawaii on their own. It wouldn't have been difficult to bring them in, of course. Anyone know if there are any indications about how long they've been in Hawaii? That might shed some light on how they got here. Where did my Monarchs go? I live in Maili, on the island of Oahu. I have a very large Crown Flower bush that I planted 8 years ago, to specifically attract & raise Monarchs because I love watching them. This spring was a very bountiful one, and they ate the bush bare! I had to re-home some of them so they wouldn't starve! Well, about a month ago, I noticed that there are absolutely no caterpillars on my bush. I am astounded, because usually my bush is very busy with butterflies and caterpillars in various stages. I remember seeing many chrysalis' in the past that had not hatched, and were black, but I just thought it was part of natures "natural selection". I did not worry, until now. I do not use any poison in my yard for any plant pests, so I am worried that maybe I have a pest or parasite problem. What can I do? I really do miss my butterflies and caterpillars! I started raising monarch butterflies along with gulf fritillaries, and Chinese swallowtails back in July...such an awesome experience but my problem is the constant need for crownflowers!! I am growing a butterfly garden, and more crown flower plants in our small lot here in Ewa beach. To tell you honestly, I am much, much happier and have more positive outlook in life since I started raising Monarchs. I just moved to the island a few months ago and have been wondering if the butterflies that I had been seeing were actually monarchs because I was thinking I would never see them again once I moved here. Monarchs are definitely my favorite butterfly and I had done some research papers on them on the mainland before I graduated. I haven't had the opportunity to catch one yet and examine it so I decided to Google it and came across this page. I am curious as to how they wound up here and how the first ones to land here adapted to eating different plant species. I'm excited to start my new butterfly collection here in Hawaii! I live in New England, so was amazed to see monarch butterflies in Kipahulu, and they nectar on a type of milkweed plant, the one with the great hollow seed pods that kids love to pop. I'm interested in what not migrating means to this population of monarchs, since migration is such an important part of the life cycle of the majority of monarchs. Will the Hawaii monarchs change in certain ways over time since they aren't migrating? How did monarchs get to Hawaii? How did the monarchs get here and why do you raise them? While Crown Flower is certainly the most well-known kind of Asclepias in the state, we DO have other milkweeds here. Most notably, we have Chinese Violet, Bloodflower, Silky Gold Milkweed, Goose Milkweed/Balloon Plant, Giant Calotrope, and Apple of Sodom/Roostertree, which I feed my classroom caterpillars. Thanks for the great information on asclepias in Hawaii! Do your caterpillars have a favorite of the plants? Female Monarch Butterflies deposit eggs for the next generation during these migrations. Monarch butterflies are the milkweed butterfly in the family Nymphalidae. Really beautiful. The male is also slightly larger. The Monarch butterflies go through four stages during one life cycle and through the four generations in one year. It is a little confusing. 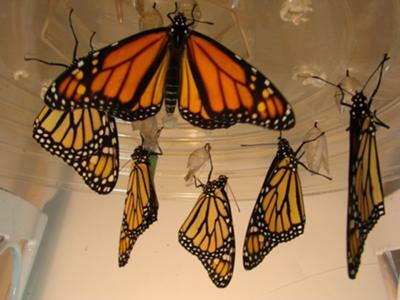 The four stages of the monarch butterfly life cycle are the egg, the larvae, the pupa, and the adult butterfly. I am thrilled to have discovered this site! Monarch butterflies are remarkable creatures, even in Hawaii, on the island of Oahu, in the northeast town of Kailua! It has been about five years since I have cultivated the interest in the incredible metamorphosis of the caterpillar. We have an appearance of Monarchs already, and it is still January! I usually harvest an abundant number of eggs in March, April,and May. Last year, I had a small crop in September and October. Amazing creatures, indeed! My name is Adriane and I work with Southwest Monarch Study in tagging Monarchs in Arizona. I was recently visiting big Island and saw lots of monarchs. I realize that Hawaii Monarchs don't migrate but in teaching a person how to tag Monarchs, we tagged 5 monarchs near the Kmart near Makala Poa Street. Be on the lookout for blue tags that have email address and # on it - if you find one it will tell us how far they might travel on the island. Not sure if anyone else on island is tagging. My friend will be out again next weekend to see if some are still there.